Stamp like a PRO! Wildflowers Stamping Gel takes stamping to a whole new level not just a basic stamp! Stamping Gel gives you the ability to add foil, chrome, pigment, glitter, and even emboss your images from your favorite Wildflowers Stamping Plate! *Stamping Gel has shelf life is 12 months. Please shake Wildflowers Stamping Gel well before each use. REMOVE EXCESS GEL from the stamper head. Tip: Try your best to use a very graceful movement with even pressure (do not press down in the middle of your roll). 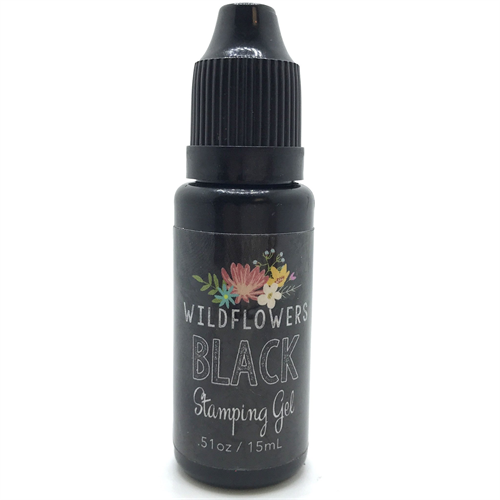 Pick up the Black Stamping Gel with your Wildflowers Clear Stamper. Stamp foil directly over the top of the Black Stamping Gel. Pick up image with your Wildflowers Clear Stamper. Stamp the image directly on a tack-free surface. VERY LIGHTLY dust the image with pigment (similar to sugaring - feather light pressure on an eyeshadow applicator works just fine). Use on a buffed surface -OR- a surface that has already been chromed with another color.